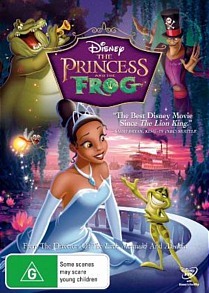 I didn’t watch The Princess and the Frog at the cinemas, but after having watched it on DVD I’m certainly kicking myself for not seeing it on the big screen. It’s the first Disney feature in six years to feature traditional hand-drawn animation and it looks absolutely fantastic, a fact which comes as no great surprise considering the film is directed by John Musker and Ron Clements, the duo previously responsible for such Disney classics as Aladdin, Hercules and The Little Mermaid. The story centres around a poverty-stricken young waitress named Tiana who dreams of nothing more than opening a restaurant in her home town of New Orleans. Her wealthy friend Charlotte LaBouff, meanwhile, is besotted with the visiting Prince Naveen of Maldonia, who is to attend a sumptuous banquet at the LaBouff family mansion. Before he can make it however he is turned into a frog by a conniving voodoo magician named Dr Facilier, who replaces Naveen with an imposter who will serve his selfish and rather dastardly ends. The real Naveen escapes, and encounters Tiana. Although taken aback to be confronted with the sight of a talking frog, Tiana can’t resist the enticement to become a princess herself by granting the little green fellow the most cursory of kisses. Needless the say the plan goes thoroughly awry, and the next hour of music, magic, escapism and high jinks is amongst the most whimsical and entertaining Disney have produced in years. Taking inspiration for the look of the film from Lady and the Tramp, which both Musker and Clements view as the pinnacle of Disney’s animated output, the film looks sensational. It’s picturesque, painterly backgrounds are near-unparalleled and its character designs echo Aladdin, whilst the songs are fun, frenetic and highly accomplished affairs. The characters themselves are well-drawn in every possible sense and voiced to perfection by a strong cast of lesser-known but inordinately talented actors. Jennifer Cody deserves particular praise for vividly bringing to life Charlotte, the breathily excitable Southern Belle whose lines constitute some of the funniest in the film. On the audio front the film features a score composed by Disney stalwart Randy Newman, and the orchestral arrangements, jazzy improvisations and original songs constituting the soundtrack all sound superb in a 5.1 DD surround. Video quality likewise never falters, and further incentive comes in the form of an audio commentary with the two directors, four deleted scenes with optional introductions, a music video and more. The Princess and the Frog harks back to Disney’s Golden Age and is a joyous celebration for those of all ages, with an abundance of wit and charm, resplendent visuals and a cast of Louisiana natives combining to make a modern-day fairytale of unrivalled splendour.